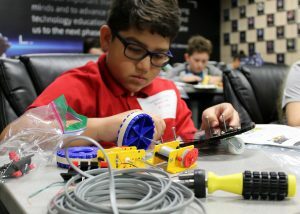 (HARLINGEN) – Sixth grader Abigail Alaniz sat inside a briefing room and built a remote control robot at the Texas State Technical College Challenger Learning Center during the college’s first Science, Technology, Engineering and Mathematics (STEM) Summer Camp. 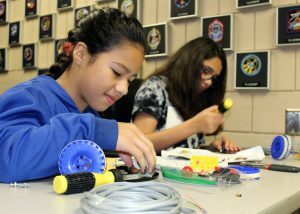 The 11-year-old, who will be attending Miller Jordan Middle School in San Benito in the fall, said she has always had an interest in robotics and was excited for her first STEM camp experience. Alaniz, who hopes to do other camps like this in the future, added that she was excited to finish the project, test it and take photos with her masterpiece. She also said she hopes to continue practicing robotics and hopes to be a scientist when she grows up. The Challenger Learning Center’s pilot program began June 12 and ran for two weeks for students ages six to 14 from across the Rio Grande Valley. The half-day summer camp focused on astronomy, rocketry and robotics through hands-on experiences and age-appropriate activities. “STEM is a huge initiative for the school districts in our area. Our program allows us to support the schools and keep students engaged in STEM fields and learning even during summer break,” said Yvette Mendoza, TSTC College Readiness coordinator. The camp was divided into four age groups: Atlantis, age six to seven; Discovery, ages eight and nine, Endeavor, ages 10-12 and Challenger, ages 13 and 14. Atlantis and Discovery students made magnetic slime and launched rockets respectively, and also completed the center’s Micronauts Program which offers kindergarten through fourth-grade students the opportunity to learn science through hands-on projects such as experimenting with magnets and microscopes and learning about computer coding and the solar system with TSTC’s planetarium. Students like Alaniz and one of her campmates, seventh grader Randall Garcia from Gutierrez Middle School in Harlingen, were part of team Endeavor. Endeavor and Challenger teams built and raced robots and completed Challenger space shuttle flight missions. TSTC College Readiness Director Neri Balli said the camp has allowed them to open the world of STEM to even the youngest learners and open their eyes to the career opportunities available in the field. Mendoza said the camp was at capacity for both weeks. For more information or to schedule a tour of the Challenger Learning Center, call 956-364-4125.